At the beginning of January I started working with one of the departments in the Volunteer Centre: the Core Team. This department works with adult members of the community and supports them to find volunteering opportunities and access training services. My role includes: interviewing clients to help them find the right volunteer opportunities, updating the main volunteering website (Do-It.org), dealing with volunteers enquiries, dealing with organisations that are looking for volunteers, helping organise volunteering events. Working with the core team has been a very good experience, I learnt and I’m still learning a lot. When I started my volunteer project I was scared to talk with people or to answer the phone because I thought my English was not very good. Then I started working with the core team and, little by little, I learnt how to interview volunteers and how to deal with the different kind of people that you can meet, also answering the phone is not a problem anymore. Moreover I improved my IT skills a lot, and have learnt how to use the main database, Salesforce, and also the websites that we use to find the volunteers opportunities for the clients. And finally, I did various training courses thanks to the core team, such as “train the trainer” and “events fundraising” that have helped me to increase my skills in different areas. I have only two months left before my project will end unfortunately, but I’m sure that they will continue to be full of new good things to learn. 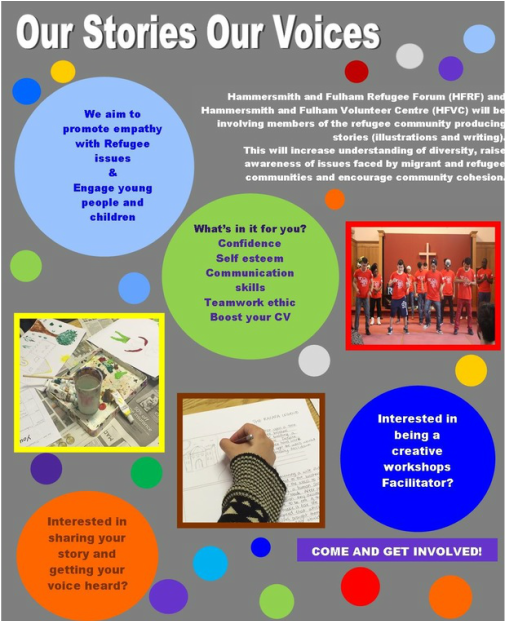 In October last year one of my colleague’s told me that our Volunteer Centre was going to start a project with the Hammersmith and Fulham Refugee forum, and that we were going to participate. The name of the project was Our Stories Our Voices and the aim was to involve members of the refugee community in producing stories (illustrations and writing). This would increase understanding of diversity, raise awareness of issues faced by migrant and refugee communities and encourage community cohesion. I was really happy to learn about this project, but also a little bit scared; the project seemed very interesting but also really challenging. We had to recruited young people with a refugee background and, with them, do some workshops in which they could tell us stories about their countries as well as illustrate them. Following the workshops we needed to collect all the stories and put them in a book that it would be presented at Refugee Week event that would take place in London in the middle of June. We did a lot of workshops in the months up to December and we collected a large number of stories. I did these workshops together with my colleague Peter who. But at the end of December he told me that from January he was not going to lead the project anymore but that I would do it. I was really worried about this, I didn’t know what to do and I was scared I would make mistakes. But I did it. I started to run the workshops alone and to meet with the children and I have to say that it was not as hard as I thought. Now, I’m still doing it. I’m really happy about how it’s going, I really enjoy it, I feel more confident about it, I love doing the workshops with the children and I’m sure that at the end the project will be a success. The YouthPass is one of the key activities of the EVS project. Youthpass is a European recognition tool for non-formal and informal learning in youth work. It is for projects funded by Erasmus+ Youth in Action and Youth in Action programmes. With Youthpass the participants of these projects can describe what they have done and show what they have learnt. It’s a document that every EVS volunteer has to complete during his or her own project and fill up with all the different competences that they have learnt from their volunteering experience. Each of these sections has to be completed by the end of the project, with a summary of all the skills that you have developed through the year. It’s a really useful document that helps an EVS volunteer to record and understand better the activities that he or she has undertaken and to reflect on all their learning and achievements. The YouthPass is also a big help when job hunting because in many countries it can be used as a CV. The On Arrival training is the first step in terms of EVS training, the second step is the mid–term evaluation. The mid–term evaluation consists of two days training in which you talk about what you have achieved in the first half of your project, and what do you have to do in the final months. In the same way as with the on arrival training, you have the chance to share your experiences with others EVS volunteers. It is a moment to meet new people, to discuss feelings about experiences that you have in common, and to talk about the good and the bad things happened. It’s one of the high lights of the project. My mid-term evaluation took place in London, at the beginning of March, 7 months after the start of my project. The training was really good; two days to talk about all the different aspects of the EVS experience and to show and put in practise everything we had learnt. We spent the first day talking about the expectations that we had in respect of the project at the beginning, and how now we feel about them. The second day was spent talking about the Youth Pass and future opportunities. It was a great experience to reflect on where we were when we arrived and what we had done until now. Sometimes is difficult to recognise our achievements, but my trainer, a wonderful woman, helped us to think and work on our experiences. This allowed us to realise all the steps that we had taken, obstacles we had overcome so that we could clearly see how far we had come in only 7 months. Another great experience. I have taken part in two trainings as part of the EVS project, the On Arrival Training and the Mid-Term Evaluation. These two training workshops aim to put in contact people and volunteers that are engaged in a volunteer project in the same area, to train them, let them know what to expect from their project, and help them to start their volunteering in the best way possible. The training workshops offer a beautiful moment to share experiences, to feel closer with people and to talk about the experiences that everyone is living. My On Arrival training was in Bath, a wonderful old city in the Somerset, in the South west of England. I did the training at the beginning of October and it was a great experience. The training lasted one week and I met a lot of young people who I was able to share and talk about my first period in England, including the good and the bad things. It was really helpful because I realised that everyone faced, more or less, the same issues: initial problems with the language, first impact with the new volunteer work, and the first impact with the new culture and traditions. Each training day was divided in a lot of different activities, some of them linked with the EVS such as the rights and responsibilities of an EVS volunteer, information about the Youth Pass, and some of them linked with English culture. We did group work about the differences between the different English regions in term of culture and tradition, and we also did a session on food tasting in which we sampled typical dishes from all over the UK. Outside these activities and exercises, run by two really well prepared and really funny trainers, we had a lot of time to explore the city and socialise between each other. Bath was a surprise: it’s a Roman city, full of history and culture that I would recommend everyone visits, it’s really beautiful. I carried away with me only good memories and experiences from this first training: greater knowledge about EVS and volunteering in general, more knowledge about UK, a lot of good feelings about the city and a lot of good friends. It’s definitely been one of the highlights of doing an EVS. It’s almost 7 months since the day I arrived in London, I can’t believe it. It seems only like yesterday that I was packing my bag, saying goodbye to my family and my friends, and saying goodbye to Italy. But on the other hand it seems like I’ve been here for a life time, it seems like I know this city and the people who live here for years, thanks to the lovely welcome that this city gave me. I arrived in London on July the 28th, in the afternoon, a day that I will never forget. My dream was coming true! I was going to live in the city that I liked the most, and I was going there to do one of the things that I enjoy the most: a twelve months European volunteer project; I would meet people and help people, participate in volunteering events, work in a team and so many other things. I arrived in London full of expectation, full of desire to learn new things and to meet new people. But I arrived in London also after a catastrophic flight. My flight was delayed due to bad weather, so after about 8 hours in the airport and two hours on the plane I arrived in London completely exhausted and disoriented. You can imagine my happiness when I reached the arrivals area and read my name on a sign. My European Voluntary Service mentor was there to pick me up and bring me to my new home. In that moment I felt relaxed, I was finally there and everything would be fine. Indeed, despite some language issues which meant I didn’t immediately understand everything that was said, I was so excited about my new beginning, that in a few weeks I had completely settled down, both at work and in my personal life. I found a lovely house in Twickenham, which I share with two other flatmates. I quickly found new friends through my flatmates, the courses that I have started and the people I work with. I had been warned that Londoners are cold, and to expect terrible food and weather. In fact I’ve found London to be more beautiful, more exiting, rich and full of life and opportunities than I could have expected. What surprised me the most was the organisation I have been placed in – Hammersmith and Fulham Volunteer Centre. I found the atmosphere was friendly; the colleagues are gentle, nice, and always ready to help you. My supervisor and my mentor support me in every step I take. I found a close, united team with which is a pleasure to work with. For the first four months I worked with the youth team, which worked with young people between 16 and 25 years old. I’m now working with the Core team which works with adults to find them volunteering placements in local community organisations. My project fits perfectly in this department; the name of my project is ‘A Creative Journey towards Planning and Managing Complex Social Cultural Events’ and has as its focus the intercultural differences between my own country of Italy and my hosting country, England. This is only the beginning. It will amaze you to know how many things I accomplished in this months. Also the amount of things that I have learned and the people that I have met is mind boggling. In seven months I have achieved a lot of personal goals, but not without difficulties. I found problems with language in terms of communication, I found hard to relate sometimes to other young people, and I had difficulties with the new culture and traditions in London. With time I have overcome these obstacles so that after six months I can say that I feel I have found a new home, a new country and a new life.